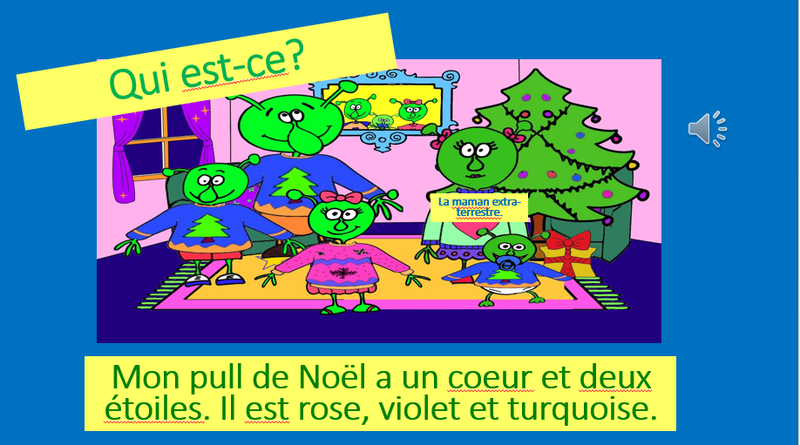 Festive FREEBIE number 3 is a Xmas Jumper sentence description power point with native speaker sound files ….and a TWIST. In it’s simplest form, it’s a game of “Guess Who?” and being reading and listening language detectives. Below are two sample slides,one French and one Spanish. It’s available now to download in both French and Spanish in the Primary Languages Network Active Lingo Shop.Here are the direct links to the resources, ready to download. The activities described below in this blog post will help you get the most out of the resource and are ideal for UKS2 and Year 7, although you can also use these with LKS2 too. 1. Listen and read along with the native speaker sound files. 2. Go on a noun hunt/ spot familiar and unfamiliar nouns/ use bilingual dictionaries to find unfamiliar language, revisiting each slide one by one. 3. Go on a colour hunt/spot familiar and unfamiliar nouns/ use bilingual dictionaries to find unfamiliar language, revisiting each slide one by one. 4. Listen to the native speaker sound files and spot who is wearing the jumper described on each slide. 4.Listen again and try to remember the sound of key words and say in your most Christmassy voice.Sell the jumper.Invite volunteers to read aliud the sentence on the slide in their best sales persons’ voices. 5. Draft write a Xmas jumper sentence to read aloud to a partner,using the sentences on the slides as models or writing from memory, dependingb on level of learners. 6. Design your own jumper and write your own descriptive sentence. 7. Colour in. and cut out the jumpers. 8. Hang up all jumpers on a class washing line or place on a display. Number the jumpers.Invite volunteers to say their own sentence . Can class link the jumper design to the child who says the sentence? .